By now, most of you should be familiar with the concept of Picross. First appearing on the Game Boy with Mario's Picross and most recently in slightly altered form in Picross 3D, Picross has always been a bit of an unassuming, almost low-key affair, but those who invest their time into it tend to discover an incredibly addictive little puzzler contained within. 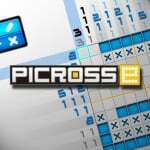 Picross E is a return to the classic, non-3D formula. The game itself has a detailed tutorial so we won't explain the rules yet again, but broadly speaking, it comes down to this: you've got a grid with a row of numbers both above and to the left of it. Using these numbers you must carefully figure out which squares on the grid to fill, eventually revealing a pixelated image resembling an object. Making mistakes costs you valuable time, and spending too long mulling over the solution will cause you to run out of time and lose the puzzle. There are four different "modes" available, but like before, technically there are only really two. Easy and Normal are played with the standard rules, with Easy containing very small 5x5 puzzles and Normal containing 10x10 and 15x15 puzzles. Free and Extra should be familiar to Picross fans - in these two, the game will not notify you when you make a mistake, which is referred to as "Free Mode". On the plus side, this means you won't get time penalties, but it also means you've got to be extra careful and only fill in squares when you're absolutely certain they should be filled. Being reckless could mean spending fifteen minutes filling squares, only to realize at some point that you made a mistake somewhere, and then spending another fifteen minutes finding and fixing it. The ability to mark squares you think should NOT be filled with a cross is especially useful during these levels. 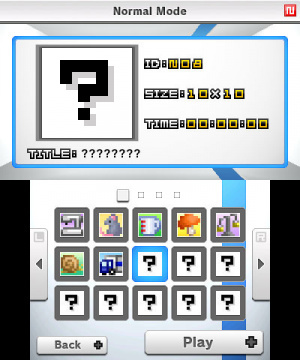 Of course, Picross E is "just" a downloadable game, but it still comes with a decent amount of levels. Easy and Extra both feature 15 puzzles, while Normal and Free have 60 each, making for 150 total. No downloadable puzzles, level editor or unlockable extras exist, unfortunately. Sadly, the game does have some small flaws that prevent it from being as enjoyable as the other games in the series. For one, it never gets particularly hard - the biggest puzzle size is 15x15, which is microscopic compared to some of the gigantic puzzles in other instalments. The hint system, allowing you to fill in one random column and row at the start of the puzzle, is also still available, but you can choose to not use it should you so choose. 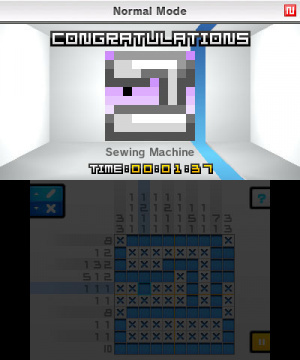 The other flaw is in the presentation, which is almost identical to the default style of Picross DS. 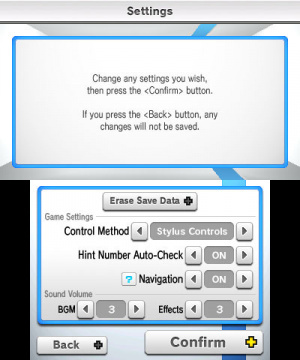 However, unlike that game, there is no option to change the appearance of puzzles or the background music, meaning you're stuck with the same theme and music the whole way through. The game isn't particularly long, but it's still a bit of an annoyance to those used to the small bits of customization the other games in the series offered. If you're starving for some more Picross puzzles, then you can't really go wrong with Picross E. It gives you a reasonably large set of 150 new puzzles to sink your teeth into, and although they're not particularly challenging, they'll at least keep you busy for a while. This is a likable appetizer, but fingers are firmly crossed that Nintendo will announce another fully-fledged retail instalment soon. Not my kind of game but glad its not shovelware, people are actually gonna enjoy this and thats what we need right now, also you guys should be hoping for some free or really cheap dlc in the future. Great review Drake. Come to NA! I love picross however I feel the game pales in comparison to previous entries in the series. However at £4.50 there's plenty of content and more for your money than the full price retail versions previously released. I'd hope for some dlc for this in future but I'd be surprised if that happened. Seriously, I'm very upset about the lack of puzzles. Unless they hid some nintendo themed ones in here I'm not buying this. And people went crazy over this for the longest time. @TheDreamingHawk : Picross E was neither developed nor published by Nintendo themselves, so no, there are no Nintendo/Mario-themed puzzles. Sadly I'll have to pass for now given Mario's Picross comes with 200 (or is it more?) puzzles & is cheaper. I may get this at a later date though. This is a awesome game and a awesome review, good job NLife. I just wish there were multiple profiles, it seems a silly omission. Or at least a way of recording high scores with names. Big fan of picross series. I've enjoyed all 3 main iterations of the game and am looking fwd to this one. Great review. This is my first Picross experience and i'm loving it! Looks like i'll have to get Mario's Picross and track down a copy of Picross DS now! I'm really enjoying this, the later levels offer a great brain workout. Nice review Drake! Thanks for review. Unfortunately, it doesnt worth me buying. Mario Picross actually has more content and a better presentation than Picross E, in spite of a lack of colour and low resolution. 192 standard puzzles + 64 randomly selected time trial puzzles, vs 150 puzzles. Mario's Picross however has a somewhat stiff and unresponsive cursor, where as Picross E can absolutely keep up with all the inputs I want to make. It also does not have a cursor wrap-around or automatically grey-out any numbers that you've filled out. Picross E is still an excellent addition to the Picross fan's collection, those who have played Mario's Picross before may find a more inviting experience without actually making the puzzles themselves easier. Those having played Picross DS however will find themselves not terribly challenged where the maximum puzzle size is only 15x15. I took me about nine and a half hours to clear all of Picross E's puzzles, I'm hoping that the next instalment, Picross E2 will feature harder puzzles, skipping right over the easy ones. It's yet another title among many that is on my watch list. Having a level editor and QR codes would mean they couldn't sell us any DLC or new Picross games. Great for us, terrible for them. Good review, I think 8 is a very fair score for this, taking into account the price. I've got about ten each of the free and Normal puzzles left to do, and then the 15 Extra puzzles, after about 8 hours play. I was slightly dissapointed there are no bigger puzzles than 15*15, but still enjoyed what is there. Agree with the final summing up in the review, i would also like to see a fully featured retail release too. but i need so much picross grids...but.but...15x15 max ? maybe there is going to be dlc ? ^There probably won't be any DLC for it. They've already released a sequel in Japan (PicrossE 2) without the first game getting any DLC. If DLC is in the works, it'll probably be for the second game. Oh that's why the developer seemed familiar...creators of TWEWY and Picross DS. If this had downloadable content I would have considered getting this but not if that's it..
Nice review and nice score! I download it as soon as I have a new e-shop card! "The other flaw is in the presentation, which is almost identical to the default style of Picross DS"
I expected so much! Just see it as a level-pack instead of a new title! But I think it's still worth it, especially at 5 Euro! "and although they're not particularly challenging, they'll at least keep you busy for a while"
Maybe the next one on the e-shop will be harder! Who knows!